« The Birds need YOU! Thank you to everyone who entered our Schools Christmas Wordsearch and the Family Festive Quiz we had a brilliant response and I am delighted to be able to announce the winners. The winner of the Schools Christmas Wordsearch was Joseph from Winterhill School, Kimberworth, Rotherham, S. Yorks and they will receive Kids Standing Raised Beds, along with 3 solid wood and stainless steel Apprentice Hand Trowels and a Kids Traditional Watering Can. 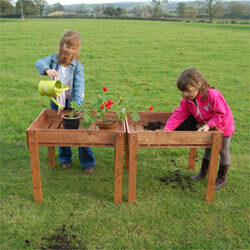 The winner of the Family Festive Quiz was James Jarvis from Southampton and his prize is the Kids Standing Raised Beds. Congratulations to you both and we hope that you all enjoy using your prizes. Don’t forget to have a go at our current competitions, in the School Zone you could win a Bug Board and a Hogitat Hedgehog House by designing a Garden for Wildlife and in our Family Competition you could win a fantastic Ceramic Bird and Bee Nester as well as a brilliantly designed Ladybird and Insect Tower by watching the wildlife from your window. With the school half term holidays fast approaching you may get some spare time then to enter. Good Luck!